Orange is the New Black creates this empathy not through easy methods of saying that deep down, we are all good people (though it is certainly an optimistic show in that regard). Instead it zeroes in the characters’ faults and looks to make their failings both unique and universal. Take the centerpiece new addition of the season, Vee (Lorraine Toussaint). She holds a similar position to that of Pennsatucky (Taryn Manning) is season one, though in a far less cartoonish manner. There is no redemption for Vee, but that isn’t necessary. Not everyone is good, and some people are so warped by their minds and circumstances that they may not deserve sympathy. But sympathy and empathy are wildly different beasts. Vee is the storm literalized in the season’s penultimate episode. She attracts a following and then slowly tears through the souls of those unlucky enough to be swayed by her. Most impacted is Taystee (Danielle Brooks) who was already a great character in the first season and becomes something else entirely here. Her background is filled in, and we find out that Vee provided her with a surrogate family, before disappearing when the heat closed in. Vee isn’t above betraying anyone as she sees fit, even poor Suzanne Warren (Uzo Aduba), a woman with a troubled, moldable mind. Yet despite all of this, largely because of Toussaint’s magnificent performance, Vee always feels authentic. Yes, she dispatches with her foster son (after sleeping with him), but you can see in her eyes that it stems from betrayal. This isn’t to forgive her; the show doesn’t ask that much. What we see, in brief and powerful glimpses, is the pain that drives this force of evil. It is in those that most oppose Vee that the season most brilliantly captures its affinity for humanity. On one hand, we have Poussey (Samira Wiley), who finds all of the people and things she loves taken from her. Her friendship with Taystee is tested throughout the season, bottoming out in painful ways that show how great Vee’s pull can be. But their bond does not break, and instead of feeling like fan-service their reunion is cathartic in the purest way. This is a show very much about connection; how community can persuade and loneliness can destroy. Taystee and Poussey need each other, a truth heightened by their momentary disconnect. The word “family” pops up over and over again throughout these episodes, showing both the cliquey structure of prison and the reason behind it: we all need somebody, no matter how tough our outer shell may seem. This idea is also clear in the powerful story arc of Red’s (Kate Mulgrew). She has been betrayed by Vee in the past, so their conflict is given additional shades. Their history, and what Vee has previously done to Taystee, help avoid the issues with the Pennsetucky story last season. There is a depth here, as old wounds resurface in entirely new contexts. Red is aging, and this season takes a startlingly profound look at what growing old can do to a person’s psyche. We have Jimmy (Patricia Square), a woman driven mad by time, turned out to the streets when the prison no longer knows how to deal with her. That moment looks at the problem with bureaucratic infrastructures, but specifically at how systems are so fond of ridding themselves of the aged. Red’s problems are more personal, as she feels displaced. She is lost without the kitchen or her prison family, and much of the season consists of her efforts to regain some semblance of control. That need for control is partially a complex, but much of it is born out of love, and the desire to protect. Television rarely looks so closely at how difficult it can be to grow old, and even more rarely does it pull it off so well. Red’s story is the clear standout of the season, and Mulgrew may be giving the best performance in the middle of what may be the best cast on any show. Not every plot was up to this standard, but nearly every one was great in some way. Morello (Yael Stone) somehow grows more crazy and more real within the same hour. She is clearly psychotic, but Stone’s performance imbues her with a subtle knowingness, keeping her from becoming a caricature. When Christopher (Stephen O’Reilly) yells at her, he is within his right to be enraged. But with the camera largely viewing their confrontation from Nichols’ (Natasha Lyonne) perspective, we remember how deeply good Morello is. As Piper (Taylor Schilling) said, this was one of the first truly nice people she met at prison. Speaking of Piper, her transformation here is well done, more interesting than last season if still not up to the bar set by the rest of the show. She is becoming unhinged, climaxing in her landing Alex (Laura Prepon) back in jail. We come back to the lonliness; Piper has pushed nearly everyone away, and her isolation is driving her to consider any option for companionship. Her ex-fiancée Larry (Jason Biggs) is the only real weakness in the season, seeming completely superfluous outside of the scene or two wherein it affects Piper. There is absolutely no reason for him to be a regular next season. Biggs is fine, even very good in spots, but his story feels so much less vital than those around it. 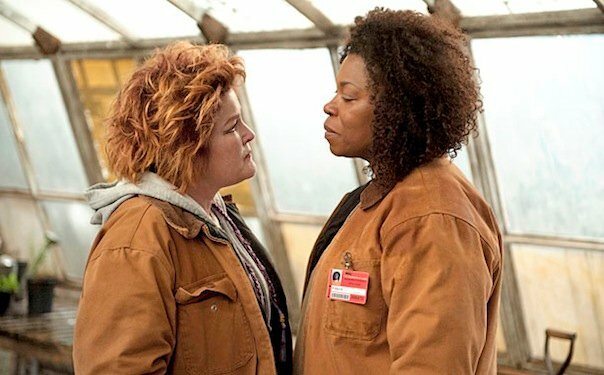 “Guards: They’re People Too!” This is one area where the show could easily skirt around the empathy, but even the management of Litchfield Correctional Facility are people simply looking for things in their lives. Fig (Alysia Reiner) is the most outlandish of the bunch, but even her troubles are partially diagnosed (though as it is with Vee, this doesn’t make her good, just human). More interesting is Caputo (Nick Sandow), who ends the season in a position of power that he already seems to be exploiting. Yes, he’s a pervert who occasionally masturbates at the thought of his inmates (though the one time he begins to do so this season, he quickly thinks otherwise). And we’ve seen how stress can drive him to obnoxious, cruel actions, like firing a guard for simply speaking up. But he also plays in a band, and he has a crush and he does, in spots, seem to genuinely want to do good for those in the prison. Healy (Michael Harney) is also a fascinating case; the show even returns to his paranoid-homophobia in the middle of a season that sees him trying to change. Though, it must be said, many of his efforts seem surface-level, doing a bad job at providing therapy and inviting his wife’s friend along on a date in desperation. Healy wants to be liked, and he confuses this for wanting to be a good person. But they’re different, and without that genuine root cause, his efforts continue to fail. Maybe the most key story of the season, though, belongs to Miss Rosa (Barbara Rosenblat). We saw her a bit last year, but here she is given the whole flashback treatment. In her younger, bank-robbing days, she believed herself to be cursed; the men who stole by her side would often wind up dead. In present day, she connects to a teenage boy during chemotherapy. Their scenes are never sappy, and their goodbye is charged with the show’s philosophy of the best relationships being found wherever you can get them. Then, of course, the season ends on her escape. It’s an emotionally effective choice (it left me bawling, at the very least), and the soundtrack of “Don’t Fear the Reaper” is sublime, if obvious. It may seem odd to end on this character, not framed as a cliffhanger but instead as her final moments onscreen. She is off to spend the last weeks of her life anywhere but in prison. This encapsulates so much of what this terrific season of television was looking to say. Here we have aging and death, two forces that define life to a large extent, and grant weight to that brief flash of a younger Rosa escaping from police. Here we have freedom, a norm for most but a dream for the prisoners on the show. Here we have community, as her escape was facilitated by Morello, and as she rids the world of the evil Vee (for being rude, of course). And, most importantly, here we have a human being. Miss Rosa will die within the month, and we will likely never see her again. But what a treat it was to spend those few hours getting to know this fictional, but deeply real person. Red says, after an attempted murder, “this place is getting to me”. She’s referring to the prison, but somehow, we all know exactly what she means. As far as the best episode of the season, my pick would probably be the Valentine’s Day-centric “You Also Have a Pizza”, but the finale (“We Have Manners. We’re Polite.”) and Miss Rosa’s episode (“Appropriately Sized Pots”) are also incredible. The first episode is the only one I would say is below great. This season also handles race well, bringing it up often enough without claiming that it is the only defining source of conflict. There are plenty of people within groups fighting for one reason or another, and key alliances that betray the simplicity of a binary. Orange is the New Black has some of my favorite pop culture references, specifically Brook (Kimiko Glenn) obnoxiously detailing the Ferris Buller/Fight Club theory, and the older women discussing the plausibility of Ratatouille. They never feel forced; instead they are just distractions from all of the pain the rest of the world delivers. I said it above, but again, Kate Mulgrew is astonishing here. Really, the entire Best Supporting Actress category should just be cast members from this show at both this year’s and next year’s Emmys. Aduba, Brooks and Wiley are also able to expertly expand on their characters from last year. This wonderful show entertains but is a picture into a very specific slice of life. Watch one episode and you will be addicted. And don't miss the absolutely campy ending to Season 2.